Even though they haven’t all been hits, I’ve enjoyed what Samuel Adams (aka The Boston Beer Company) has been doing with their new line of Limited Release beers. As you would expect, they jumped on the autumn seasonal band wagon. And even less shockingly, they brewed a Pumpkin Ale. 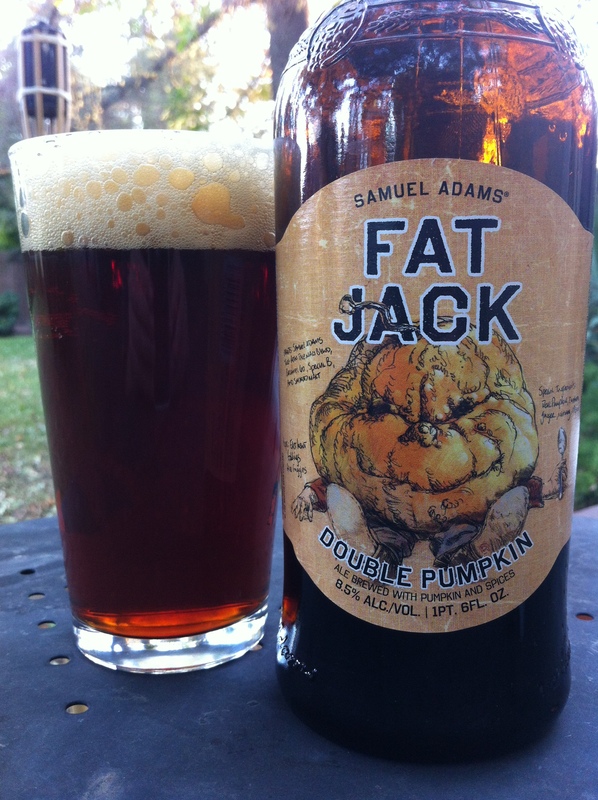 FAT JACK DOUBLE PUMPKIN ALE is a Pumpkin Ale (duh) with an 8.5% ABV. Pleasantly plump and satisfied. This rich and luscious brew indulges in flavor with over 28 lbs. of pumpkin per barrel, for a full bodied sweetness and deep russet color. Classic pumpkin pie spices like cinnamon, nutmeg, and allspice ignite a warmth and spark that’s deepened by an undercurrent of roasty smoked malts. The result is a delectable brew full of enveloping layers of flavor and spice. When you see the term “Double Pumpkin” on a label you would expect the beer to a dark orange color and Fat Jack doesn’t disappoint. The beer pours a deep amber with three inches of latte-like foam on top. Even though the carbonation is only minor, the lacing is quite prevalent (albeit sloppy). With autumn seasonals that use the traditional blend of spices in the recipe it’s not uncommon to easily detect those flavors in the nose due to their potent qualities. Fat Jack’s nose is filled with scents of actual pumpkins, ginger, and allspice, however it also has a noticeable carrot scent that really threw me for a loop. There is a touch of honey candy, like a Bit O’Honey, that adds a pleasant sweetness to the spice rack-like flavors that were previously dominating the nose. As the beer opens up it takes on an earthy/vegetable like neutrality. I really like this, because it makes the beer smell more like a pumpkin patch than the traditional pumpkin pie flavors normally associated with the style. In keeping with that earthy/homey smell, the taste is very similar to a pumpkin bread. The pumpkin comes through first (as you would expect), with the ginger and allspice following close by. It finishes with a hint of the smoked malt and a touch of that honey I mentioned above. There’s a mild rye bread spiciness that adds to that idea of eating a slice of pumpkin bread. Be aware that this is not your typical pumpkin beer and is more in line with the taste of a homemade pumpkin bread. Mouthfeel is lightish verging on medium. Carbonation is heavier than I would have expected, considering how minor the carbonation appeared visually. No real aftertaste or lingering qualities were noted, which was odd considering the highish ABV and the heavy spiciness. Fat Jack is one of the most real pumpkin flavored beers I’ve had before. However, authenticity doesn’t necessarily equal drinkability. Even though it was a nice break from the traditional pumpkin beers, I don’t think I could handle more than 22 ounces at a time.